Three years ago this week Governor Charlie Baker signed the Sales Tax Holiday bill in to law, this was the last time we had a weekend free of sales tax. Consumers and retailers have always valued these opportunities to save money, that's why I have always offered legislation to make it happen permanently. 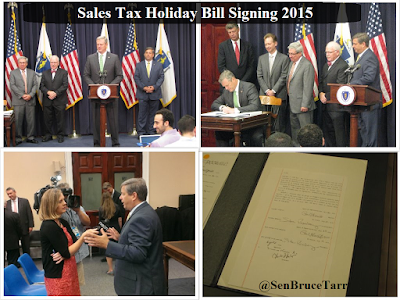 This year, I successfully added a Senate amendment to to authorize a Sales Tax Free Weekend for August 11 - 12. While the state's Department of Revenue has produced regulations for the weekend it only becomes official with the Governor's signature.